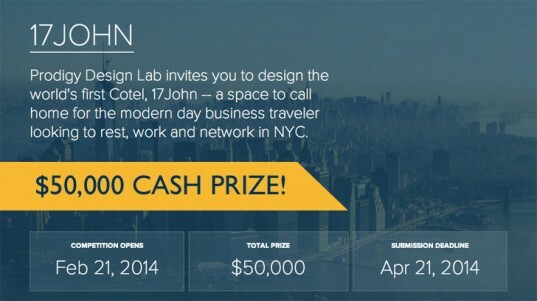 Prodigy Network is hosting a design competition to define the future of hotels. The competition is focused on Prodigy’s innovative hotel property, 17John – the world’s first Cotel (a collaborative hotel) – and has been broken down into three contest categories: a communal working space (architecture and interior design), a one bedroom guest suite (architecture and interior design), and an online guest experience (web design). Submissions can include designs for one or all three of the competition categories, (collaborative public space, private hotel suite, and digital services). Each category has different requirements, however submissions will be evaluated based on the visual material and written explanation provided by each team or individual. These materials should provide the crowd and the judges a solid understanding of the functionality and purpose related to their design proposals and when appropriate the concepts behind their decisions.